I’ve been following this healthier eating plan for about 6 weeks now, steering clear of sugar, gluten and dairy. For the most part, I’ve been completely satisfied, not really experiencing any more strong cravings after the first 10 days or so. However, last night was a different story. It has been so frigid these past few weeks, much colder than our normal mild Louisiana winters. As our family returned home from mid-week church service, I told my husband that all I wanted was to curl up with a big cup of hot chocolate. He laughed, but I was serious. So serious that I worked very hard to figure out a way to make me some cocoa with the healthier food items in my kitchen. “So I have looked upon you in the sanctuary, beholding your power and glory. 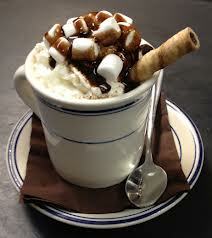 Last night, I thought that nothing would satisfy me other than a steaming mug of hot chocolate. How many other times in my life have I believed satisfaction would come from some sweet or savory dish? Yet David claims just as the stomach and taste buds are pleased with rich and fat foods,his soul will be satisfied when he blesses and praises the Lord. By the way, did you know that when David wrote Psalm 63 he was in the Judean wilderness? Usually, whenever I find myself craving something, it’s because I’m in the wilderness … either momentarily or perhaps wandering around for longer. Either way, I’m seeking something. But the thing I’m seeking can’t be satisfied with food, friends, shopping sprees, or anything else I might think I desire. My soul can only be satisfied when I find refuge in the shadow of God’s wings, praising His great name. Previous Article And The Walls Came Tumbling Down! So true Paige. The Lord provides living water. I don’t live this out in my life all the time, but when I do, I experience a joy that has no bounds and peace that lasts and lasts. Love the writing as usual!